Ceramic-matrix composites are strong, tough, environmentally stable, light in weight, and have the ability to withstand high operating temperatures. These characteristics make them viable candidate materials for high temperature structural applications. Twenty three are included in this volume describing the latest developments in the areas of ceramic fibers, processing and fabrication, oxide and non-oxide composites, carbon-carbon composites, geopolymer composites, mechanical behavior, corrosion and environmental effects, characterization, fiber-matrix interface, design of composites, and thermal/environmental barrier coatings. Proceedings of the symposium held at the 105th Annual Meeting of The American Ceramic Society, April 27-30, in Nashville, Tennessee; Ceramic Transactions, Volume 153. 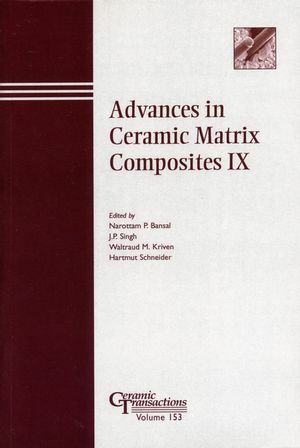 J. P. Singh is the editor of Advances in Ceramic Matrix Composites IX, published by Wiley. Hartmut Schneider is the head of the "Structural and Functional Ceramics" group at the German Aerospace Center (DLR), Institute of Materials Research, Köln (Germany) and is a Professor of Applied Mineralogy at the University of Hannover (Germany). He has been working on different topics of high pressure mineralogy and on refractory and ceramic materials. He is renowned for his research work in crystal chemistry, ceramics and composites of mullite, an alumino silicate of the stoichiometric composition 3Al2O3·2SiO2. Professor Schneider has published over 200 scientific and technical papers. His list of awards includes the Japanese Government Research Award, the Lilienthal Award, and the Fellowship of the American Ceramic Society.